Our walkabout on Wednesday turned out perfectly. The Grand Canyon is far from being just a “big ditch” as I’ve heard people cynically describe it. It has been a place of surprises and learning for us. Our route has been the Rim Trail, an easy paved walk that offers spectacular canyon views every step of the way. We picked it up where we left off on Tuesday afternoon and moseyed our way westward, stopping often. Everything along the Rim Trail is worth investigating. 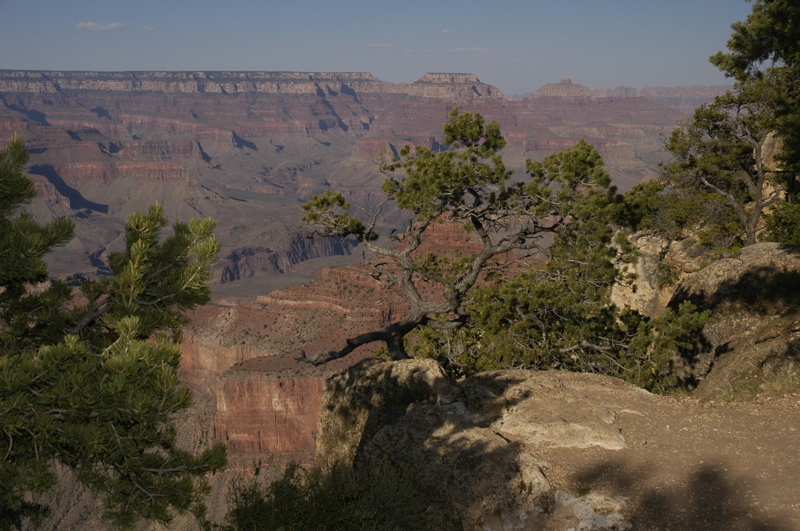 The Grand Canyon is one of those older western parks that is developed with man-made overlooks, lodges, and restaurants, so the paved portion of the Rim Trail is not a place for quiet solitude, but it is accessible to just about anyone. Tired? Sit on a bench or catch the next shuttle bus. Hungry? Drop in on one of the many restaurants. Overloaded with scenery? Hit one of the four or five shops. It’s as easy as Disney World. Fortunately, there’s still a lot of Grand Canyon that isn’t highly developed. And for those who don’t go to national parks for the eating and shopping, the historic architecture along the Rim Trail is fascinating. The Hopi House, El Tovar (lodge), Kolb Studio, and others are examples of the innovative architectural styles explored in the western national parks in the late 19th and first half of the 20th centuries. 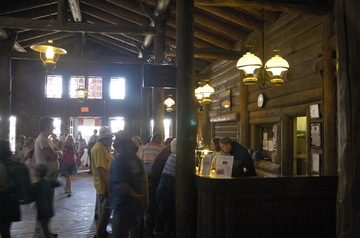 They reflect a mix of Adirondack style, western style, Fred Harvey, and Victorian style all at once. The Adirondack/Victorian mix, called “Parkitecture”, is particularly well demonstrated by El Tovar. It’s the classic brown wood style that is associated with state and national parks developed by the Civilian Conservation Corps in the 1930s. You’ve seen it, I’m sure. We’ll have an article on how Parkitecture came about in the Fall 2007 issue of Airstream Life magazine, coming out in August. 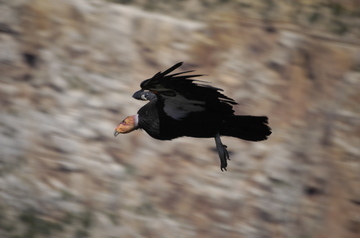 Near the Bright Angel Lodge (circa 1880s and still in use today), we began to spot California Condors soaring over the canyon. It turned out that a dead Bighorn Sheep was down in the canyon and the condors, being scavengers, were showing up in big numbers. These massive birds with their nine-foot wingspans are ancient relics. They survived mass extinctions on the planet over two hundred million years ago when thousands of other species died, but today they are a highly endangered species. Lead poisoning, attacks by humans, and collecting of eggs by scientists contributed to their decline. All of the California Condors alive today are tagged and known because the entire remaining wild population (22 pairs) was taken into captivity in 1987 in a last-ditch attempt to save the species. They did well in captivity and now over 200 are roaming California and Arizona. A lot of them are here at the Grand Canyon right now according to the guy who tracks their radio tags, and the best place to spot them is from the patio at the Artist’s Studio, just west of Bright Angel Lodge. 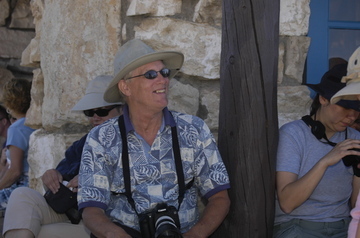 That’s where I ran into half a dozen other photographers, including one fellow who is writing a book on them. He’s snapped photos of all but ten of them. I surveyed the photographers and most were using fast 70-200 Canon zoom lenses, some with multipliers for effective lengths up to 320, and some with image stabilization. I was using my slower 55-200 Nikkor zoom, with no multiplier or image stabilization and finding it difficult to get good shots, but I did manage a few OK ones. The condors kept us entranced for over an hour, and then we caught a Ranger talk on condors, and then Ranger walk on fossils. Emma loves fossils, and she spotted numerous brachiopods (shells), as well as coral and sponges. Grand Canyon isn’t a major place for fossils but there is a spot right off the Rim Trail to find thousands of them. Emma’s Junior Ranger book is just about full. She has completed two ranger programs and one campfire program, hiked, spotted all kinds of plants and wildlife (including an elk that wandered by our camp last night), written a haiku, and written her impressions of the park ( “I feel amazed and relaxed. The air smells sweet.” Etc.) We’ll drop it by the Visitor Center at some point today to get her badge. With all of the stops we made, our total hiking distance yesterday day was less than three miles, but it was a very full day and both Emma and I returned with full memory cards in our digital cameras. Today we will do the same, walking the less-developed and unpaved section of the Rim Trail toward Hermit’s Rest, to see how else the Grand Canyon’s rim can surprise us. It is amazing to come to a national park after having seen so many incredible national parks, and being blown away once again. That’s the amazing thing about America’s national parks. They are all worth a visit. We just can’t get enough of them. 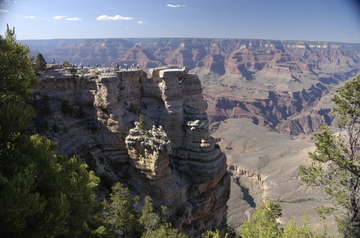 Grand Canyon is, as we expected, spectacular and inspiring. I really want to go for a hike down into the canyon to the Colorado River, and camp for a night or two at the bottom, but that’s not possible in this short visit. Also, I’ve been told that you need to make reservations months in advance for the mule-camping trips. We’ll get the lay of the land on this three-night stay and plan another long trip for next year. We’ve gotten a small taste of the south rim so far, by hiking part of the Rim Trail, riding the shuttle bus around, attending a campfire program, and starting Emma’s latest Junior Ranger program. Today our plan is to browse the rest of the Rim Trail, drop in on everything along the way, and attend a Ranger Talk. No rush, just a leisurely walkabout. The altitude here means a few adaptations. We’re at 7000 feet and so it cools off quickly at night. Last night it dropped into the 40s. Also, we all felt a little tired at first, which is a result of the thinner air. Based on our experiences last summer at high altitude in Colorado, we should adjust quickly. The “Trailer Village” (the only place in the park with hookups for campers) is not particularly attractive, but it is very convenient and has all the amenities (store, full hookups, even cable TV!) We’re not spending much time at the Airstream, however. It’s easy to hop on the LNG-powered bus and get anywhere in the park in just a few minutes. Our reputation seems to precede us. Only a few minutes after arriving, one of the park volunteers drove by and said, “You’re that Airstream Life guy!” Turns out she knows David Tidmore of Roger Williams Airstream and has followed the blog. Another “small Airstream world” story. This blog entry comes to you courtesy of someone in the campground with a satellite connection and an open wi-fi signal. Thank you, “WhitewaterVideo”. When we are camped in a remote spot and our Verizon cellular Internet system works, I always leave my wifi open for others to share, and it’s nice that someone has returned the favor. We’re parked for a quick mid-day errand in Flagstaff AZ, but in about two hours we’ll be at the south rim of the Grand Canyon for the next three nights. We may not be able to get online while there, so if the blog doesn’t get updated for a day or two, don’t think we fell into the Colorado River or something. We’ll just be in the cellular abyss. This weekend we will be buying a used satellite Internet system for backup. We currently get online using a Verizon card, and it works pretty well near populated areas — the same places your cell phone works. But it doesn’t work in the more remote national parks where cell coverage is missing, or any part of Canada and Mexico. Since we have some thoughts about traveling out of the country later this year, I decided to snag the used system while it was available. We’ll activate it later, when we are about cross the border again … although there may be moments when I am tempted to de-activate it and go into vacation mode. 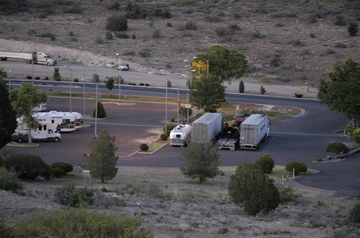 Casino parking is popular among the RV crowd, almost as popular as Wal-Mart. Out west it seems hard to be more than 50 miles from an Indian casino these days, but we’ve never taken advantage of the many casinos that are RV friendly. The only other time was at Sam’s Town Las Vegas, where they have an RV Park. It’s not that we don’t like casinos, but mostly we’ve found better alternatives, such as quiet parks or scenic areas. In this case there were plenty of commercial campgrounds but since we are just parking, Cliff Castle Casino seemed suitable. The parking turned out to be fine and friendly. I sent in a report to Casino Camper so they could update their website about it. We knew about this spot from our visit a year ago. You have to drive right past Cliff Castle Casino to get to Montezuma Castle National Monument. I wonder if the Indian frybread stand is still here? Rich C is staying only about half an hour away from here, so he dropped by with his friend Sadie for a final visit before we head east. Sadie and Eleanor hit it off right away, finding common interests in a theory that (as far as I can tell) involves eating mass quantities of chocolate and red wine to prevent cancer. They even got online for a few minutes to study the molecular structure of some elements found in chocolate. I picked this spot for the overnight stop because it was convenient to our route and the casino has family stuff, including bowling, which Emma loves. 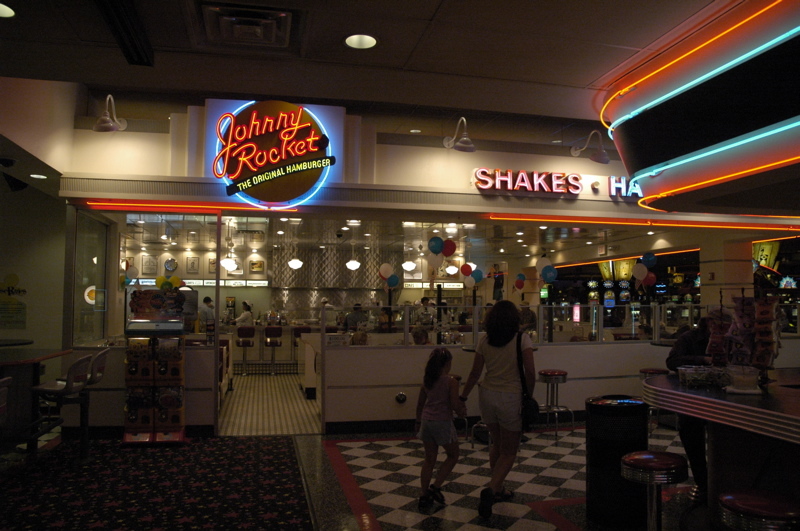 There’s also a Johnny Rockets restaurant, which is the sort of place we only go as a treat when we are on the road. It helps break up the day of driving and put everyone in the right mood. At only 3000 feet we haven’t yet escaped the heat. It was in the low 90s all afternoon. But tomorrow will be a different story. Only about 40 miles up the road is Flagstaff, elevation 7000 — an entirely different climate zone. Even though daytime highs will be in the low 80s at the south rim of the Grand Canyon, the forecast is for near-freezing temperatures at night. We’ll have to start carrying sweatshirts in the car again. Two weeks of nearly straight-out renovation and many thousands of dollars later, we are at a good point to break away. And it is absolutely needed. The relentless joys of renovation are wearing us out. We could certainly stay here long if we cared to. There have been snags which we could correct, given time. The big one was a shortage of grout. Being a good general contractor, I have been inventorying supplies each night and estimating what we might need the next day. But we did run unexpectedly short of grout, and by the time we saw the problem, it was Sunday of the holiday weekend and there was no hope of getting more. Nobody except the tile store seemed to carry the color we are using, and they were closed. Oh well. The floor is 95% done. All the slates are laid, and most of the floor is grouted. The rest will have to get done later. We are leaving on schedule, Monday morning. We have reservations at the Grand Canyon which I am NOT going to cancel. So the “lock-and-leave” house is ready for its first test. The neighbors are alerted, everyone has our contact info, there will be a house watcher coming by, and we’ve verified all the plumbing and electric. The air conditioning is off, the water heater is on “vacation” setting, smoke detectors are working, and a dozen other details have been taken care of. The house can await our return in a few months. No hurry. We’ll be back when the time is right. With another full day of house work behind us, we were looking for something relaxing to do this evening. 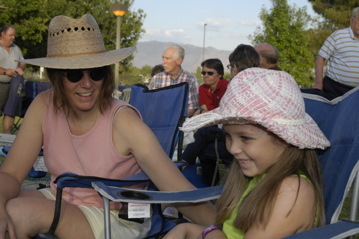 Our neighbor Carol must have read our minds, because she popped over late in the afternoon to invite us to join her at the park for a Saturday night concert. 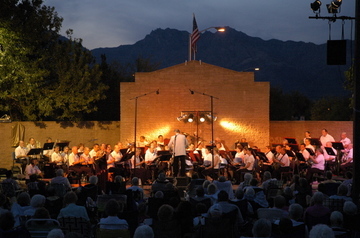 For a few weeks in the late spring the Arizona Symphonic Winds provide free open air concerts in Morris K Udall Park, and that seemed the perfect thing to do on a balmy Tucson evening. We stopped off at Nico’s for a few of their huge burritos to go. It’s hard to go far wrong with Mexican food in Tucson, and Nico’s excells at making dinner burritos for short money. With those, a Thermos of ice water, and a few cookies, we had an instant picnic. The concert venue is a grassy amphitheater surrounded by trees. With the warm breeze in the evening I could easily imagine us at a summer concert back in New England. Only the mountains and the lack of mosquitoes are different. 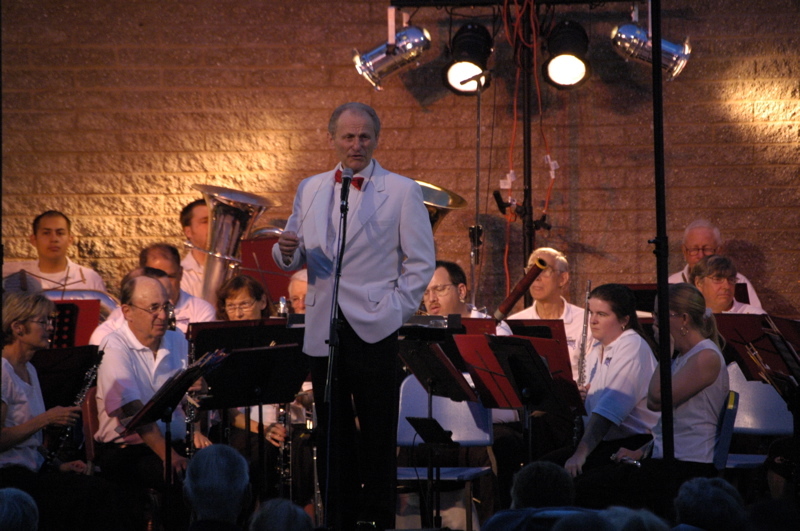 We munched our burritos from folding chairs and watched the bats circle overhead while the orchestra played. Tomorrow is our last day in Tucson. We’ve got a long punch list of things to complete on the house, but if we get an early start (before the heat builds) it should all get done. 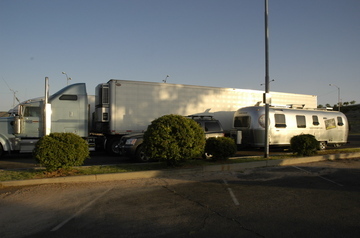 By tomorrow night, the Airstream will be packed and we’ll be ready to hitch up and go Monday morning. See you on the road! This past two weeks, we have had only one day where the temperature did not reach 90 (it was only 89 on Tuesday). Since it is only May, some would call that a clue. The local weather forecasters say the average first day of 100 degrees arrives about May 11 on average (which coincidentally is the average last freeze back in Vermont and thus marks a safe date to plant your vegetables). The latter comment is said with a knowing smile. If we take the bait, the followup is, “It gets hot here.” At first we took this seriously, and would attempt to explain that we’ve been here for a while, and yes, we are aware that it gets hot. But we’ve come to realize that both of the Two Standard Comments are like pickup lines in a bar; They’re just intended to foster conversation. Sure, a lot of people probably wish we hadn’t considered the possibility that it gets really hot in the desert southwest in the summer. Imagine the fun watching our jaws drop as they explain the realities of 110 degree days — every day — for weeks on end. We might even drop whatever we’re carrying and run screaming to the nearest airport in search of a flight to anywhere other than this scorching land. What fun that would be to watch! I expect we’ve disappointed a few people. We have explained a dozen times in the past two weeks that we don’t expect to spend any summers here at all. After all, we are Avis Niva, snowbirds (non-retired variety). I’ve stopped mentioning that, too, because it seems to kill the conversation. I think it’s a bit like running away to Florida from New England. You’re expected to stay and do penance with the everyone else. Nobody wants to hear about your winter in the sunshine, and here in Tucson nobody wants to hear about the cool green summers of Vermont. But just in case you didn’t know, it gets hot here.